NeoRecruit version 4.0.9 is available ! 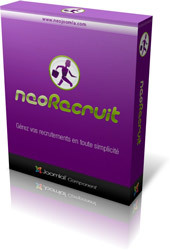 Here it is the latest version of the component NeoRecruit, compatible with Joomla 3.6. This update version fixes a minor bug found in the back-office and improves the translations in German. This corrective release will be the last version of the extension before the version 4.1, that will provide some new features to the component, like an export system for the job offers and the applications for example. It should also be noted that a new version of the module NeoRecruit Categories is currently in development, and will be released in in the next few days.